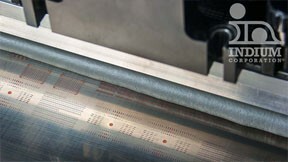 Indium Corporation presented its suite of void-reducing solder pastes, including halogen-free, no-clean Indium8.9HF, at Productronica 2015, Nov. 10-13, in Munich, Germany. Indium8.9HF is specifically formulated to reduce or eliminate voiding for improved finished goods reliability. This paste is perfectly suited for a variety of applications, especially automotive assembly, due to its unique oxidation barrier technology. Indium 8.9HF delivers robust reflow capabilities and a wide processing window, which accommodates various board sizes and throughput requirements, and minimizes potential defects. In addition to outstanding print transfer and excellent response-to-pause, Indium8.9HF also provides excellent pin-in-paste solderability and hole-fill, while remaining stable at room temperature for up to 30 days. Indium8.9HF solder paste is part of Indium Corporation’s family of high-performance, lead-free, low-voiding, no-clean solder pastes. For more information about Indium8.9HF, email askus@indium.com, visit www.indium.com/productronica-germany-2015, or stop by Indium Corporation’s stand in hall A4 at booth #214.